Tame the yeast might be a wonderful way to get over those baking with yeast jitters, but to be truthful, I don't think these jitters can go so fast. Last month Valli made me do this challenge and even though I was nervous I followed Varda's recipe and baked a bread. My confidence shooted and I thought I have mastered the art. For this months challenge I tried Priya Suresh's whole wheat flax seed buns. APF is kind of banned in the family so I happily started with this bread. I followed all the steps , and tried the bread. The result was average.I really don't know where I went wrong. The bread was rather dense and I found it a little yeasty. While it came out of the oven everyone ate and had similar comments, though more than half the buns got over. I know that I had gone wrong because Mir baked the same buns and hers were quite spongy, may be Priya can tell me after giving these a look. Priya I will copy paste the recipe that you have given for two reasons. One I do not want to miss anything.two, who so ever bakes these buns, should not make the mistake that I might have made. Thanks dear. And now coming to the recipe. Take the wholewheat flour,all purpose flour, flaxmeal,sugar, salt and instant yeast in a bowl. Add in the luke warm milk, olive oil and knead everything until the dough turns soft and smooth. Arrange the dough in a greased bowl, wrap the bowl and arrange in a warm place. Don't disturb for 2 hours. Once the dough doubled the volume, punch the dough and knead for 2-3 minutes, roll it as a log. 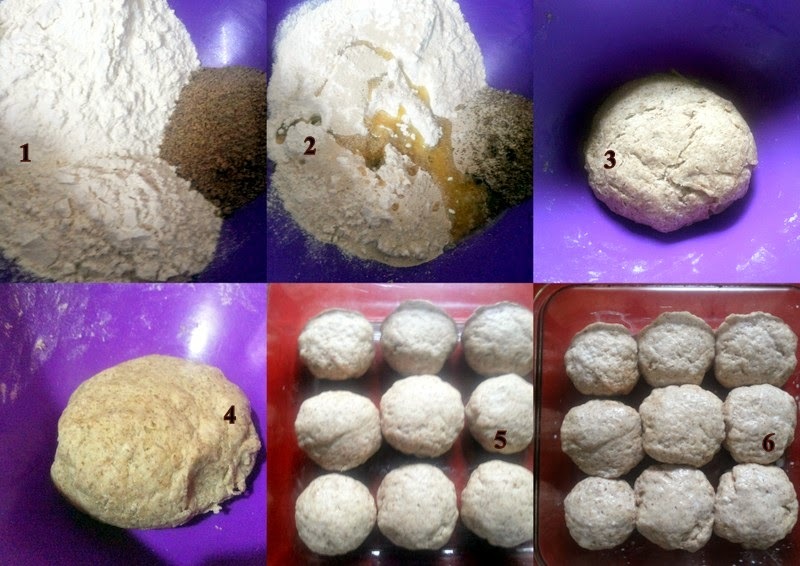 Divide the dough into 9 equal pieces, roll each pieces as a round ball. Arrange the ball in a greased square pan, one by one with enough place in between. Cover the pan with a towel, keep aside for 40-45 minutes in a warm place until the balls rises. Preheat the oven at 350F/180C for 10 minutes. Brush the rolls with milk gently, bake in middle rack for 30-35 minutes or until the crust turns golden brown.